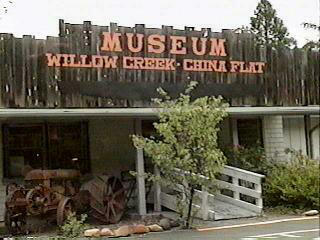 Just arrived back home from the Willow Creek-China Flat Bigfoot Museum Grand Opening celebration. I just wanted to give you my overall observation and thoughts on the exciting weekend event. When I arrived in Willow Creek, CA at 4:00 a.m. on Sat. morning I was completely exhausted from the 12-hour drive from Aberdeen Washington. I was wondering if the long drive was really going to be worth it, but in reality I new it would. I was really looking forward to seeing the impressive assortment of casts, photos, and other exhibits donated by the estate of the late Bob Titmus. At 10:00 a.m. the museum board president Rogenen Rawlins opened the ceremonies with a welcome speech, and thanked the many volunteers who provided assistance with the construction of the new wing. Humboldt County Supervisor Paul Kirk presented the museum with an official resolution, and Ms. Gertie Hoogendorn heir to and donor of the Bob Titmus collection performed the ribbon-cutting event. At approximately 11:00 a.m. Mr. John Green spoke briefly about the history of Bluff Creek and the valuable discoveries that took place involving the late Bob Titmus and others. A few questions were taken from the media and public, and I thought Mr. Green did a great job answer them with his knowledge and memory of past events. After John Green, Dr. Jeff Meldrum stepped up and gave a short presentation of his interpretation of some of the Bluff Creek casts and was afterwards pelted with questions. I must say, Mr. Daniel Perez pulls no punches in his questions and tried to pin Dr. Meldrum down on his overall take regarding the Sasquatch phenomena. Questions ranging from Sasquatch population size to personal belief were thrown at Dr. Meldrum and I think he responded truthfully and professionally. After the opening presentations the museum was opened up, and I finally was able to meet Ray Crowe of the Western Bigfoot Society. After a while Ray was kind enough to take me over to John Green and introduce us. I decided then that the trip was definitely worth it. I was impressed with the museum during my walk through, and think everyone interested in the Sasquatch/Bigfoot mystery should see it. Many of the original Bluff Creek casts were displayed, along with photos and displays of old newspaper clippings and Willow Creek memorabilia. At 12 noon the museum board hosted a potluck luncheon just outside the museum. There was a BBQ and a lot of great food and desserts. The starting line to the tables was long, so I decided to go through the museum again to look over some of the photos and casts again more closely. At that time I bumped into Todd Neiss for the first time, and introduced myself. Todd was another person whom I have had many e mail and phone call conversations with but never met face to face. Todd and I had a great visit together, and we shared our theories and many observations we have come across. Todd Neiss has a lot of experience working in the field, this is especially true around the Mt. Hood area of Oregon. After I finally went through the food line, I sat down at an empty table all by myself. (No I was not being anti-social) Todd Neiss and I were one of the last few to go through, and all the tables were full. Any way, there I was sitting alone, when all the sudden Mr. John Green comes over to my table and sits across from me. Did I mention I thought the long drive was worth it? Actually in all seriousness, we had a great discussion and I really appreciated the down to earth personality he has. Around 8 hours later (actually probably less than an hour) two kind ladies practically took our plates away and told us they had to start cleaning up. :) Todd Neiss and I got the hint and grabbed our drinks before they were rolled up in the tablecloth. At around 1:00 p.m. everyone was invited to join John Green and Dr. Jeff Meldrum on the 2nd floor of the museum for a presentation and slide show. John Green gave an excellent recap of events that lead up to the Patterson Gimlin filming and his past involvement with persons like Bob Titmus. His story was fascinating, and very entertaining. Many of the questions I had in my mind revolving around the entire Bluff Creek history and the events surrounding Roger Patterson and Bob Gimlin's discovery were answered or put to rest. On one note, John admitted that he believed whole heatedly that the next generation of researchers would solve the mystery and probably with the use of modern advancements in technology. After John Green was finished Dr. Jeff Meldrum gave an excellent in depth presentation and slide show. Dr. Meldrum explained many of the technical aspects of analyzing footprints and casts of prints. His presentation was extremely interesting, especially when presenting the dynamic signatures of the Patterson/Gimlin creature's overall gait and foot pathology. Many slides of tracks, casts, and close up shots of dermal ridges were shown. Dr. Meldrum's research and comments on the mobility of Sasquatch and the effective use of the foot design was very convincing. I gave the presentation an A+, and thanked Dr. Meldrum afterwards for his work. I stuck around late socializing with others and meeting folks from all over before leaving the museum. It was beginning to rain and getting late, so I decided to pack it in, and head up to Bluff Creek. After I paid 2.05 a gallon for gas in Willow Creek, I cursed, then left to check out the overall terrain around Bluff Creek. All I can say is, if you plan on going into where the Patterson/Gimlin footage was shot, be prepared! The geography is not friendly to our bipedal bodies, and is more rugged and dense than I ever imagined. And this quote comes from a seasoned hunter/hiker used to the Pacific Northwest's Olympic Mountains and lower rain forests. I took some photos of the area, and will post them to the Washington State Sasquatch Search Groups web site soon. In closing, go see the museum if you can, I really enjoyed it. Thank you Dr. Jeff Meldrum and John Green for your presentations and everyone affiliated with the museums opening success, you made my weekend trip unforgettable.